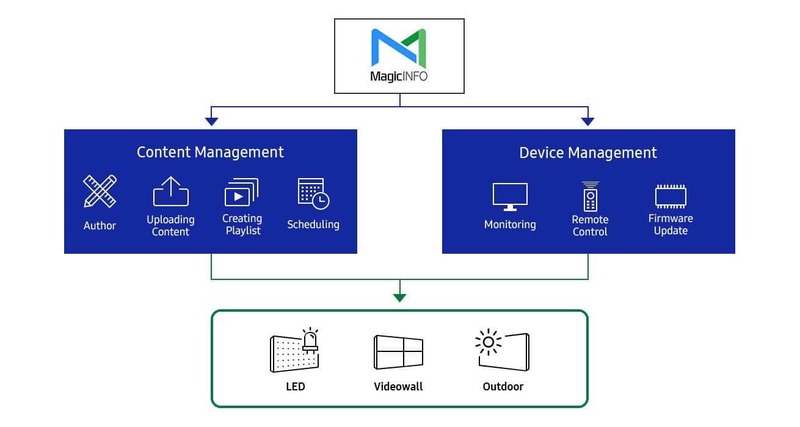 The IF-D Series’ dynamic peaking technology combats natural or ambient lighting interference. 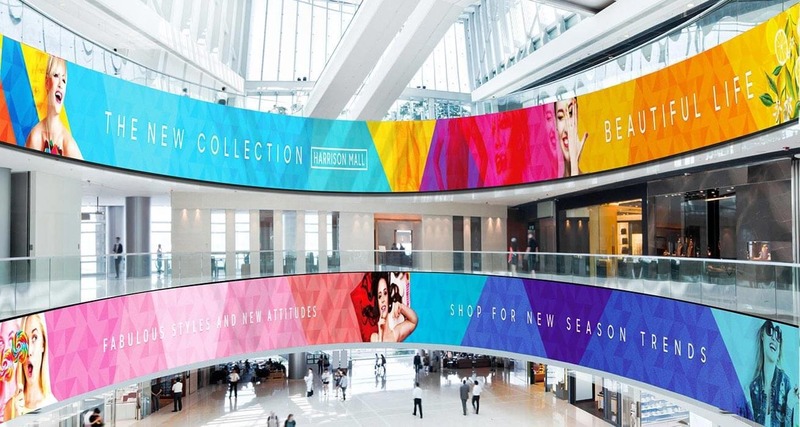 Dynamic peaking elevates content to peak brightness levels nearly twice as high as the standard LED signage maximum. In turn, the IF-D Series produces brilliant content that shines against any background. 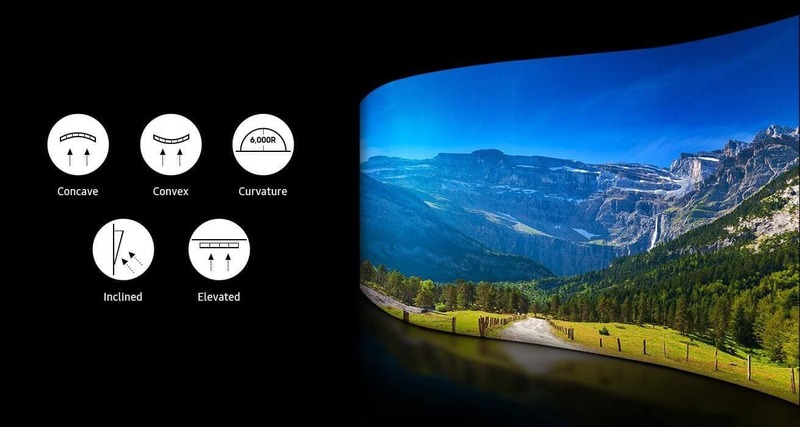 * Here, “Conventional LED Display” refers to displays that do not contain dynamic peaking technology. In both conventional and advanced models, peak brightness and standard brightness can vary depending on composition and usage. 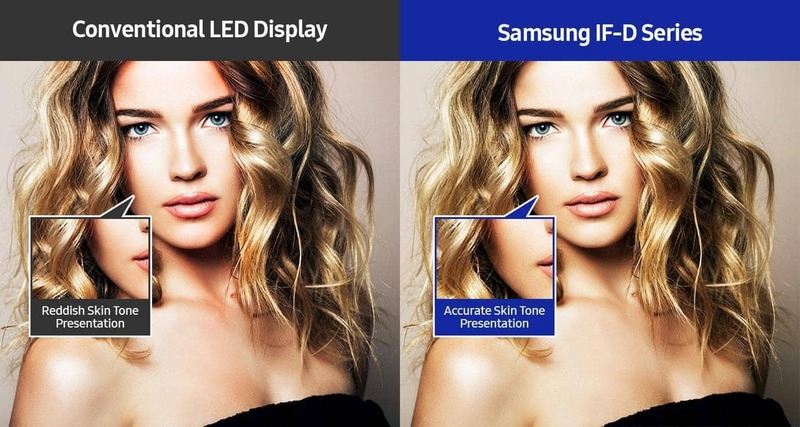 Certain LED displays struggle with oversaturation that can give skin tones an unnatural reddish hue. 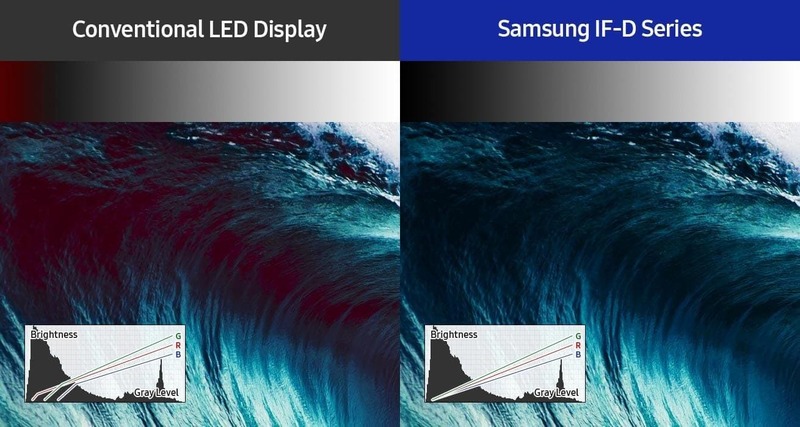 Samsung’s IF-D Series displays mitigate these variations and maintain consistent gradation through in-depth color management, ensuring all featured subjects appear with lifelike realism. 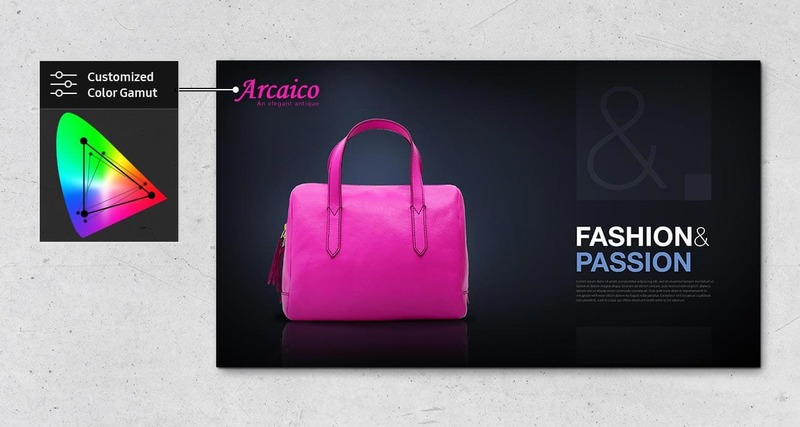 * Here, “Conventional LED Display” refers to displays that do not contain color management technology. 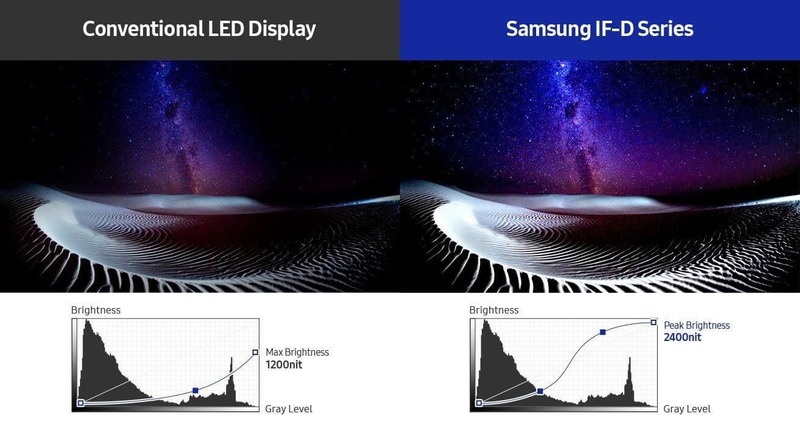 Samsung’s IF-D Series displays leverage strict Scene Adaptive HDR technology to create a comfortable, uniform long-term viewing arena. This includes specialized inverse tone mapping that analyzes and optimizes gradation and brightness levels within individual scenes while also eliminating shine. * Here, “Conventional LED Display” refers to displays that do not contain inverse tone mapping technology. A unique grayscale management algorithm empowers the IF-D Series to deliver consistent red, green and blue hues without distortion, even in low grayscale. Such color stability ensures optimal and uninterrupted picture quality in museums, galleries and other low-brightness indoor environments. 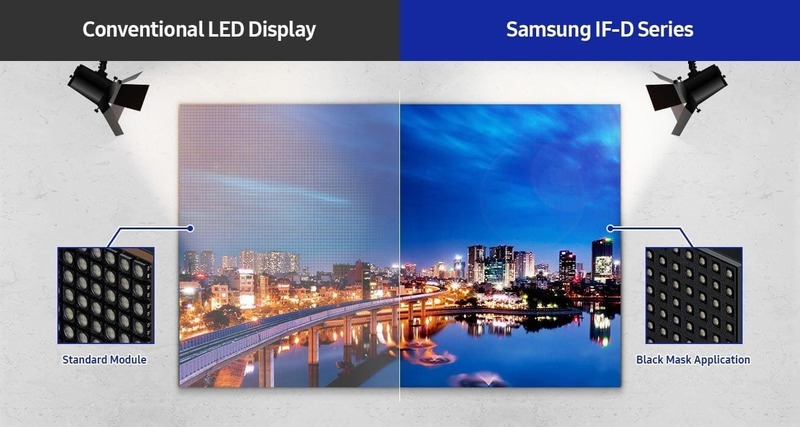 * Here, “Conventional LED Display” refers to displays that do not contain integrated low grayscale correction technology. Dynamic lighting can expose higher pixel-pitch LED displays’ lead framework. IF-D Series eliminate this visual inconsistency by applying an external black mask* across the LED module. This mask closes the gaps responsible for the ensuing glittering effect, and reinforces uniform contrast. * The black mask module only is applicable for the IF040H-D and IF060H-D models. * Here, “Conventional LED Display” refers to displays that do not apply external mask. The IF-D Series’ advanced design includes eye-catching convex* and concave curved configurations (up to 6,000R). 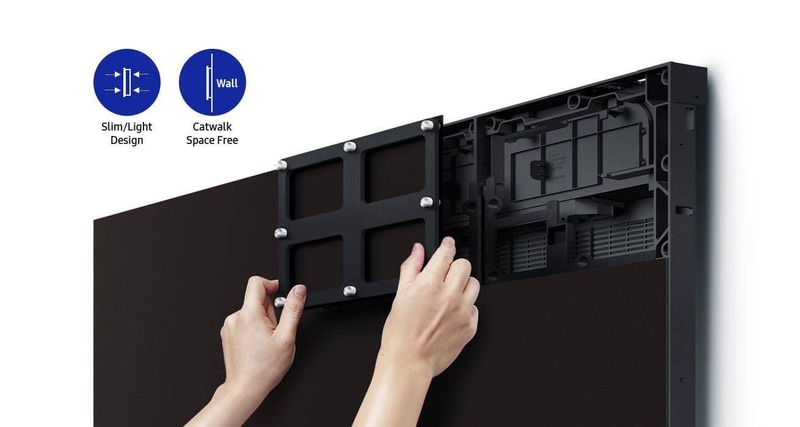 Additionally, businesses can align their IF-D Series displays on an incline or adhere them to a ceiling**, opening new engagement possibilities regardless of environmental constraints. * Convex designs are only available for the IF025H-D, IF040H-D and IF060H-D models. ** Inclined or ceiling installations are only possible with the IF040H-D and IF060H-D models. Samsung’s compatible S-Box condenses the delivery of compelling content to a single, centralized device. The S-Box transmits UHD content across multiple IF-D Series displays without requiring external boxes or splitters, helping businesses enjoy faster and more cost-efficient operations. * “Conventional display” settings will vary depending on the companion sending box and type of content ultimately presented.